Aircraft shot down a Junkers Ju-88 with code F6 + AK (number 0285) was shot down in the 25 July 1941 by the pilots of the 3rd Fighter Air about Istria and made an emergency landing in a clearing in the forest near Moscow. Five days later, it installed on Sverdlov Square (now Theatre Square) in Moscow. 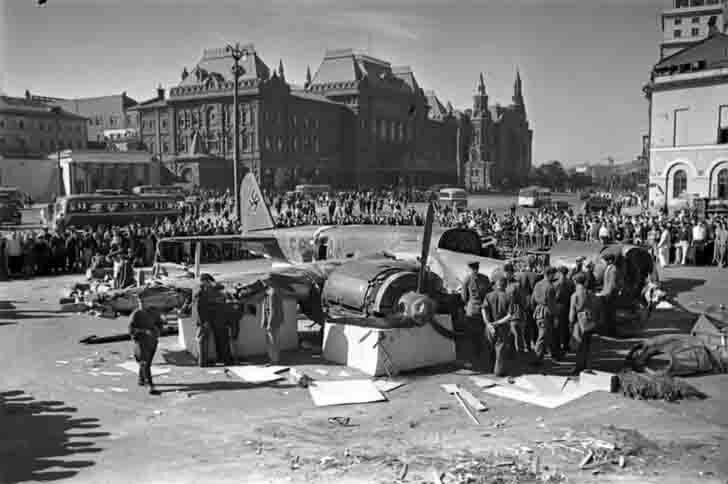 Ju-88 aircraft shot down belonged to the 2nd Far reconnaissance squadron of the 122 th Intelligence Group (2. (F)/122), aircraft shot down conducting reconnaissance flight to Moscow-Kaluga region. Corporal Werner Ludwig – gunner. Information about the fate of the crew is not. The German military archives are listed as missing.